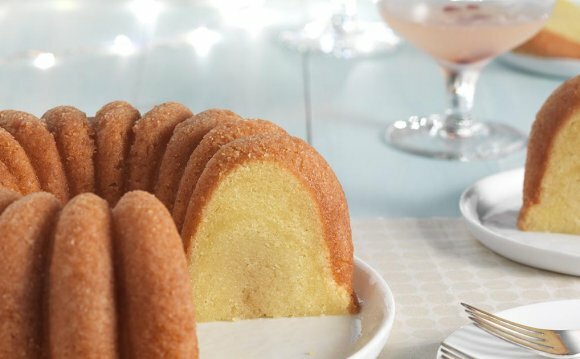 The next day after work, I returned to TJ Maxx and bought two more rum cakes-full-size this time. I proceeded to spend the next few weeks eating rum cake every night, returning to TJ Maxx regularly to replenish my supply. On one visit I finally realized that it would make more sense to just buy every cake they had left in stock (yes, this "made sense" to me)...so I did. I was so excited about the prospect of bringing home all these cakes that it didn't even occur to me to be embarrassed as I walked to the register with a tower of 8 rum cakes balanced in my arms. "These are really, really good, " I told the bemused cashier. When I got back in January, the first thing on my agenda was recreating this cake at home. I searched the Internet for recipes, but all the ones I found relied on a combination of boxed cake and pudding mixes. I wanted to make rum cake from scratch, without bags of powdery substances. I finally found one recipe that was all from scratch except for the pudding mix (this, I’m sure you’ve guessed, is what led me to my ). Not perfect, but definitely a start! After a few trials and errors, I figured it out; I adjusted the original homemade rum cake recipe slightly, and then replaced the packaged pudding mix called for in the recipe with a cup of my (essentially a combination of powdered milk and cornstarch). I pulled it from the oven, poured on the syrup, and waited anxiously until morning to see if it worked.